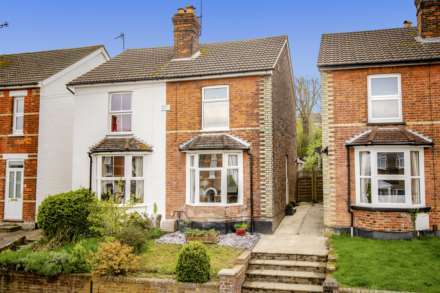 A a charming semi-detached Victorian house in a popular residential street in Rusthall village. Retaining much of its original charm and character, including period fireplaces and high ceilings, it has the benefit of a converted second floor making it a substantial family home. Its smart period red brick exterior is mingled with wall climbing plants and a charming wooden door with stained glass which entices you across its threshold. Inside, the hallway is bright with a decorative radiator cabinet and crisply painted cream walls making it a smart and welcoming space. To the right is a large and beautiful living room with wooden flooring, a high ceiling and period detail. Light pours into the room from the generous bay window with a handsome fireplace offering warmth in the colder months. Paneled double doors at the rear can cleverly extend the living room into the dining room to give you excellent entertaining space when the need arises. The dining room itself, also accessed from the hallway, is linked seamlessly by the same warm wooden flooring and has plenty of space for a large dining table and chairs. Conveniently placed behind is the kitchen whose honey coloured wooden units contrast beautifully with the eye-catching wall and floor tiling. A sink placed under the window to enable you to keep an eye on the children playing in the garden and space for a table and chairs make it a great family room. Climbing the carpeted stairs to the first floor, a bright and spacious landing has three bedrooms and a family bathroom leading off it. The master bedroom, with two fitted wardrobes, stretches the width of the house and is flooded with light from its two front windows, one of which is a beautiful bay. The second floor has a further delightful double bedroom with excellent storage space. A large modern shower room with walk in shower completes the floor. This exceptional family home has the advantage of a lovely low maintenance rear garden that is accessed directly off the kitchen. It is secluded and laid mainly to lawn with a smart decked terrace at the rear of the house, perfect for alfresco dining. Arranged over three floors, this property couldn`t`t feel more homely and with its smart and sympathetic update, it is Victorian property that has been transformed into an elegant family home. A must see! Kitchen/Breakfast Room: 15` x 11`5` rear aspect double glazed window. The kitchen is a perfectly planned area with plenty of worktop space and under stair pantry with shelving for storage. There is a selection of wooden eye and base level units and room for a table and chairs. The integrated appliances include a 4 ring gas hob with stainless steel extractor hood and splash back and electric oven with a freestanding fridge/freezer, dishwasher and washing machine. There is a tiled surround, tiled floor sink and drainer and a radiator. A door leads off the kitchen into the garden. Bedroom 1: 14`11` x 13`8` front aspect double glazed windows, one bay, alcove wardrobes and radiators. Bedroom 2: 12`11` x 10`5` rear aspect double glazed window overlooking the garden and radiator. Family Bathroom: side aspect double glazed window, panel enclosed bath with mixer tap, hand held shower attachment and wall mounted Aqualisa shower, pedestal hand wash basin with mixer tap, low level WC, heated towel rail, part tiled walls and wooden effect laminate flooring. Bedroom 3: 11`5` x 9`1` double glazed rear aspect window and radiator. Shower room: rear aspect double glazed window, side aspect double glazed Velux windows, eaves storage, pedestal hand wash basin, low level WC, walk in corner shower cubicle with wall mounted shower, mosaic tiled effect laminate flooring and extractor fan. 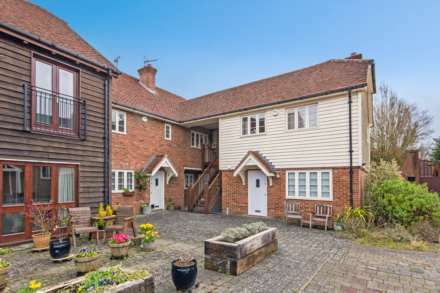 Outside: to the front of the property is a tiled pathway with a low-level brick wall with garden space behind. A side cast iron gate with stone pathway leads down the side of the house providing rear garden access through a wooden gate. To the rear is a garden, laid to lawn with a large decked terrace for entertaining. There is perimeter wooden fencing on all sides, some with mature hedging in front, some trees and shrubs and a wooden shed.